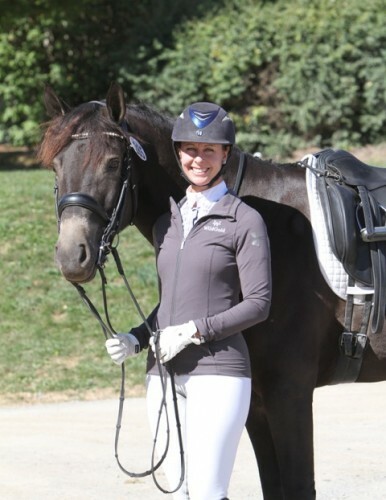 Jessica Jo (JJ) Tate believes in Classical Dressage and how it benefits all horses, whatever the sport or discipline. 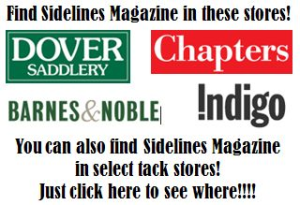 One good example is Kynynmont Gunsmoke’s Gideon, the 3/4 Connemara gelding she trained and competed to third place nationally in the 2015 U.S. Dressage Finals Fourth Level Open Championship at Kentucky Horse Park in November. 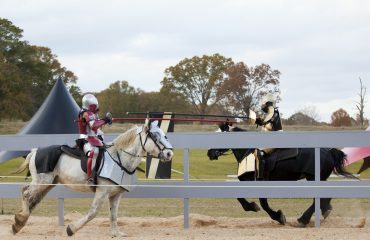 They also competed in the Prix St. Georges Open Championship. The “pony” has impressed JJ with his attitude and potential. JJ started riding Gideon a year ago. His owner-breeder, Pam Liddell, needed a rider-trainer for a “really talented mare” at the upper levels and sent her to JJ. Before long, Pam was taking lessons with JJ, which resulted in sending Gideon to JJ for training. Shortly thereafter, Pam sent two more homebreds, Kynynmont Cooper O’Grady and Kynynmont Blue Sapphire (Sophie), from her farm in Pennyslvania to JJ, who trains them with her own assistant, Kaitlin Blythe, riding the officially carded Connemara ponies. Cooper, Pam’s younger purebred Connemara stallion, has progeny coming along and is half-brother to Gideon, both sired by *Gun Smoke, a purebred Connemara stallion in Ireland; Cooper is out of Moira, Gideon out of Tara, both Kynynmont mares. 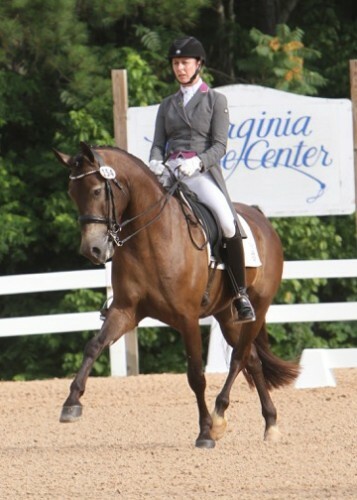 JJ’s assistant Kaitlyn piloted Cooper to the Third Level Open Championship in the 2015 National Dressage Pony Cup Finals and finished the year at Fourth Level. Kaitlin rode Sophie at the NDPC, earning the 2015 FEI Reserve Championship. 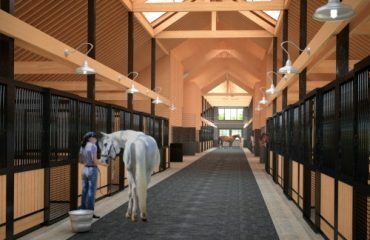 The equines are happy and thriving — a major element of JJ’s mission as trainer and rider. Gideon, competed by JJ Tate, is owned by breeder Pam Liddell. A video of Gideon and JJ doing a Fourth Level test shows the springiness of his collected trot that someday will animate his piaffe and passage; ditto, glimpses of future one- and two-tempis in Gideon’s lead changes every three strides. 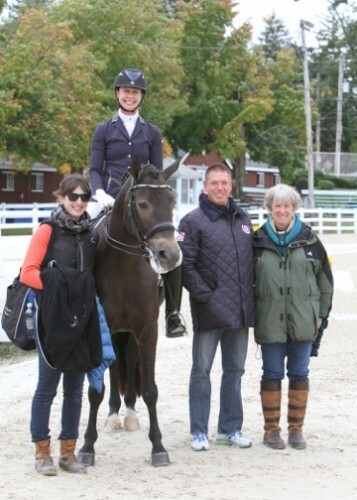 Team Tate: left to right, groom Marina Lemay, JJ and Gideon, JJ’s coach Scott Hassler and breeder and owner Pam Liddell. JJ will be the first to describe 2015 as a great year for Team Tate Dressage. 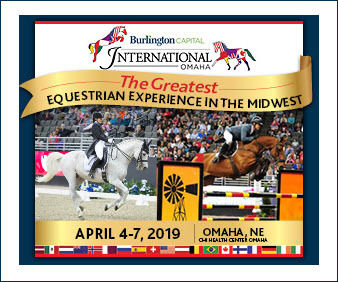 Felis Apollo, 5, her Dutch Warmblood gelding, an American bred by Judy Yancey, earned the top score of the day when he won First Level, Test 3 Open with 75.294 percent at the Great American Insurance Group/U.S. Dressage Federation (GAIG/USDF) Region 1 Dressage Championships at the Virginia Horse Center. The weekend before Regionals, he was high score of the show on 85.455 percent at the BLM Championships at the Garden State Classic, New Jersey. JJ trained and rode her 8-year-old, 17.1 Hanoverian mare Summersby (Summer) to the Region 1 Prix St. Georges Championship with a 75.197 percent and was fourth in the USDF Markel Developing Prix St. Georges Championships. 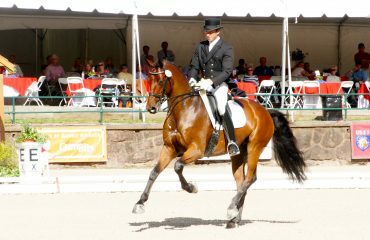 JJ also trains and competes Faberge (Fiji), a 13-year-old Westfalen Grand Prix gelding owned by Elizabeth Guarisco. She has young horses coming along, including two Hanoverian geldings, Fürst Han Solo (Hans), 4, and Scantinos (Sammy), 3. 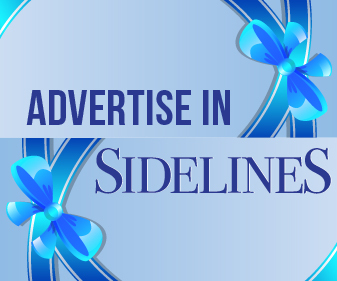 JJ’s very excited about their potential and hopes to find syndicate members for them. Gideon was sired by *Gun Smoke, a purebred Connemara stallion in Ireland. 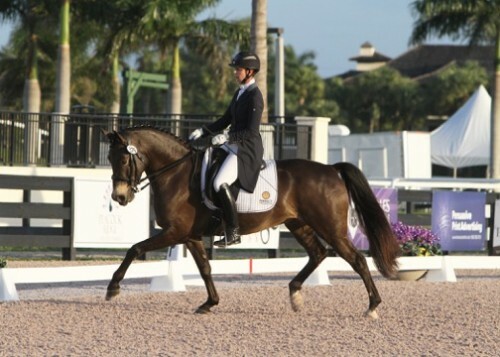 JJ earned her U.S. Dressage bronze medal at 14 and her silver medal at 16 when she made her FEI debut. At 18, her parents continued to support their daughter’s passion for horses by helping JJ to take two horses to Hungary to train for nearly three years with Gyula Dallos, multiple European and Hungarian National Dressage Champion. After her return to the states, JJ earned her USDF gold medal. The nation’s top Young Rider at Grand Prix in 1999, she led the Region 2 Dressage Team to the silver medal at the North America Young Riders Championships at Tempel Farms, Illinois. That fall, she turned professional and never looked back. In the interim, she has harvested many championships, reserves and rosettes, but what’s most important to JJ is how she uses what she learns day in and day out with each of “her” horses. In addition to de Kunffy and Dallos, JJ has trained with Oded Shimoni, Gerhard Politz, and Walter Zettl. 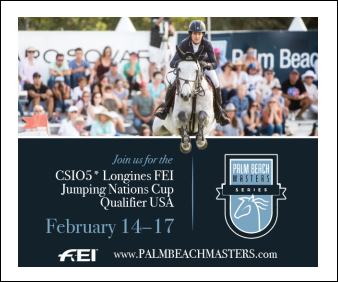 She rides whenever she can with Steffen Peters and, as a U.S. Developing Rider, trains with Debbie McDonald. She takes weekly lessons in the winter with Michael Klimke and rides weekly year-round with Scott Hassler. So far, JJ has trained and competed 24 horses to FEI levels, many going on to Grand Prix with her or her students. 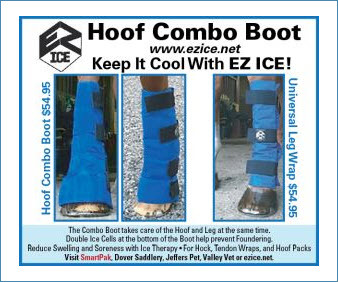 A skilled instructor and popular clinician, she has helped many horses and riders from green to Grand Prix. Eight students have earned the USDF gold medal. 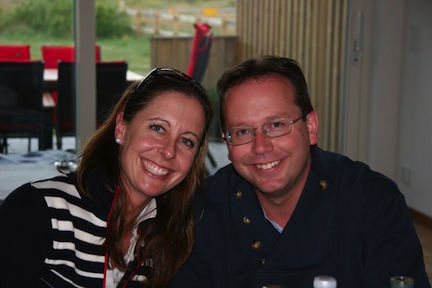 JJ and her husband Richard. About the writer: Lauren R. Giannini is an award-winning journalist and avid photographer, specializing in stories about the equestrian world, wildlife and conservation. Lauren lives in the heart of Horse Country Virginia, watched over by her CEO (canine executive officer), a rescue who sums up perfectly the term “hybrid vigor.” Lauren’s pleasures and pastimes include horses, travel, especially to Kenya, and writing about wildlife, conservation and eco-tourism. Books are next on her to-do list.